Some MLS teams just don’t prioritize U.S. Open Cup games. Fair statement, particularly when talking about the teams towards the top of the regular season standings. But plenty of teams do play to win as you get deeper into the tournament, and sandwiching these games in between regular season games is still a significant test. Nobody goes to Open Cup games. In my experience, this is mostly true, until you get to later rounds. This seems to be a function of not being included in season ticket packages, less advance notice of game dates, and a general lack of awareness and buzz for the tournament in general. I’ll admit that this does take a little of the excitement away, as compared to a league game. It’s not even on TV. The fact that we’re relegated to watching streaming video online and the games are nowhere to be found on television does make the whole tournament feel a bit small time. Tough one to counter, though I’d argue that live U.S. Open Cup matches can offer plenty of drama (upsets by lower tier teams!) and opportunities to see interesting young MLS players get more run time. All of those items above are true, but I firmly believe that when the Union visit the Houston Dynamo on September 26, we’ll be witnessing the most important match in team history. First, the tournament is in its 105th edition, so there really is a whole lot of history behind the U.S. Open Cup tournament. History that up through today includes our Philadelphia Union making three finals is nice, but there are no cup and no banners flown for runners up. Second, we have a team that’s seemingly turned a corner. Had the Union had even an average beginning to this season, they’d be firmly entrenched in playoff qualifying territory. It may well be too little too late to get into a favorable playoff spot and make noise there, but a U.S. Open Cup victory next month is validation that we’ve done something right, and is a building block towards future success. It also has the very tangible benefit of participating in next year’s CONCACAF Champions’ League. Most importantly though, this team and this fan base have been through so much, and it’s so incredibly important to win this upcoming final to simply win something. This club is overdue. We’ve survived the Piotr Nowak era of spankings, water deprivation and shady Latin American signings. We’ve made it through disastrous player moves (e.g. M’Bolhi signing, two LeToux trades), sun rockets, fan favorites gone too soon (e.g. Nogueira, Barnetta), and those regrettable all-gold uniforms. The Nick Sackiewicz era alone was enough of a test, only to be followed by the Earnie Stewart era that was cut short before any 5-year plan could be seen to fruition. 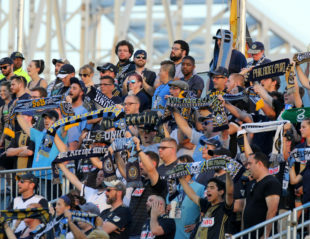 Collectively, Union fans are a loyal, resilient group, but nine years later, apathy has become harder and harder to fend off. Winning a cup changes the trajectory of this team, at least in the near term. Winning begets winning, and we need to start somewhere. Establishing a winning culture, that players want to come join, requires our club to win something meaningful. Flying halfway across the country and winning a road final, after months of taking care of U.S. Open Cup business, shows that this team is capable of seeing things through. Maybe it even becomes a spring board towards greater success in years to come. And what a great reward it would be for individual fans who have been season ticket holders for years, bought their fair share of jerseys, t-shirts, and track jackets, or those who’ve regularly followed the path of this team on PSP or television. I really hope we can find the final on TV that night. It will only be the most important match in the team’s history if it wins. It’s already been to the finals twice now, each equally important. We were a few inches of a Nogueira volley away from the cup the first time and a few botched penalties away the second. This might arguably be our best chance to win, though it’s the first final the team is playing away. I think the Supporters Shield is an entirely forgettable trophy. I get that it’s harder to win than the Open Cup, but with the unbalanced schedules, there’s something unauthoritative about it, if that makes sense. I think trophies should be awarded to winners of each conference champ, noting that accomplishment, and that MLS cup would be additional. I’d endorse getting rid of playoffs altogether and just having a league match between the two conference champs, but that will never happen. Agreed that if we lose, it falls level with the other open cup finals in significance. I mainly just believe it’s the most important today because it’s the next/first chance to win something and go down in the books as a champ of something. I also agree that the supporters shield winner is quickly forgotten, given that American sports leagues are all playoff focused. It is sad for the history of this tournament to be looked at as being unimportant. I truly knew nothing about it till Ed Farnsworth posted soccer 101 on this very site. Really think US soccer could do much better of promoting it!. I’m sorry about the negativity, but how does the Cup validate us? To get to the final we beat Richmond, a terrible Chicago team, and an Orlando team that is imploding. We had one win against a competent team (NYRB). Don’t get me wrong, I’ll take the little bit of extra cash and CCL spot, but I don’t see how it is an accurate indication of success. Interestingly enough Houston who spends less than the Union has on salary (dead last) has made it to the final as well. In any championship season you could nitpick how a team won. From schedule, travel, injuries or opponents there is always something to complain about. Meanwhile they’ve made it to the final and the game has the prize of the CCL attached to it. The Union academy graduating players to play games in MLS is a goal of the organization but playing meaningful international games would be a bonus. Also only FC Dallas and the New England Revolution of the seven MLS teams who have won the U.S.Open Cup haven’t won the MLS Cup. Interestingly enough, the one time they won they played each other. So it might have a part in building a winning culture. The Union are pretty close the the bottom of an MLS hole trying – not very hard mind you – to dig ourselves out. Other teams like DC are scaling the walls of the hole, while a third of the league is dancing around in the sun up there. An Open Cup win will absolutely help us. Since Sugarman won’t be injecting any cash, this is the way we progress. Prize money from the Open Cup, but more importantly money from being in the CCL, is the only way we are going to improve our roster/$$ problems. Sure we played a bunch of bad teams to get here, and are going up against a Houston that has 2pts from their last 6 league games, but we are in the final of a meaningful tournament. Either way it goes, it will be one of the three most important games we’ve played. If we win this game, it will by far be the biggest win in Union history to this point. We have a good road record this year. We are going at teams on the road this year. Houston is not great at home this year. I was at the last two finals where we were so close. I’ll be watching on tv this year, but I like our chances. Go get some hardware Union!! !